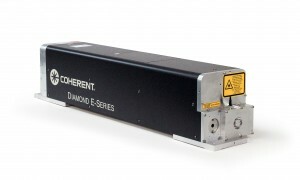 Santa Clara, Calif.,November 4, 2013–The new DIAMOND E-250 is the latest member of the E Series CO2 laser family fromindustry leading Coherent, Inc. (Santa Clara, CA) (Nasdaq: COHR). The power range for the Coherent E-Series product line extends from 150W to 1000W, with thousands of lasers installed worldwide. The new DIAMONDE-250 is a fully sealed, pulsed CO2 laser offering 250W of average power and > 750W of peak pulse power. The DIAMONDE 250 has its RF power module integrated within the same housing as the laser tube, eliminating the RF umbilical cable required in older Coherent K-series lasersas well asother suppliers with separate RF power supply units. Theintegrated DIAMOND E-250 design utilizes state-of-the-art electronics, and is more compact and reliable than any other comparable CO2 laser on the market today. With an output wavelength of 10.6 µm, theDIAMOND E-250 targets a wide range of materials processing applications in which throughput, quality, process capability and low cost of ownership are critical, and where a minimal footprint is desired. Applications include converting, cutting, drilling, scribing, engraving, and marking of a wide variety of materials such as paper, cardboard, acrylic, plastic, glass, ceramics, textiles, denim, leather, rubber, thin metals, wood and stone. In addition to the DIAMOND E-250, Coherent is also offering the new DIAMOND E-250i in the same advanced compact configuration with an output wavelength of 9.4 µm. The shorter wavelength is ideal for processing a number of materials such as films and plastics used in mobile devices. Founded in 1966, Coherent, Inc. is a world leader in providing photonics based solutions to the commercial and scientific research markets, and is part of the Standard & Poor’s SmallCap 600 Index and the Russell 2000. Please direct any questions about this press release to Andy Held, Director of Marketing, at 860-769-3148. For more information about Coherent, including product and financial updates, visit our website at http://www.Coherent.com.